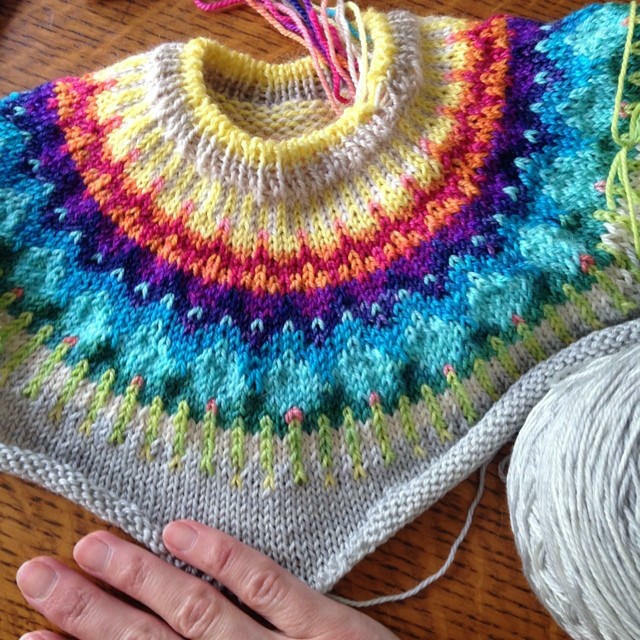 I have been working away on the little yoked sweater that I posted about the other week. Actually, I've finished that sweater and have started and finished a second almost exactly the same. This type of project never gets boring, It's the perfect knit. Fun and exciting but small and manageable. You're done the yoke before you have time to find all the colours cumbersome. The sweater pictured above is for Rowan. I wanted to knit his with a light colour for the body to contrast the darker Grape I used in the first version… but I didn't like it. I don't know why, looking at it now I think that maybe I was crazy because it looks really lovely. But it's too late. I've ripped out the Chris Grey and have finished it in Charcoal and it's beautiful. I think that I made a good call, but that keeping the Chris Grey would have been good too, and now I miss the Chris Grey version.... Sometimes there is just more than one right choice. Maybe a version 3.0 is in my future!